Blanquette de Veau, Thyme for Cooking French gourmet main course. Braised veal and vegetables, finished with a white wine sauce is a classic French dish, easy to make, delicious, and impressive to serve. It can easily be expanded for a dinner party. Cut meat into large chunks, 1 1/2 " (3.75 cm). Cut the onion in half and stud with cloves. Peel the carrots and cut in half the short way, then in half the long way. Place meat, onion, carrots and bouquet garni in a heavy saucepan or casserole. Pour the white wine over and 1 cup of the chicken stock to cover, adding water if needed. Bring to a boil over medium heat, cover, reduce heat and simmer, very gently, for 90 minutes. 30 - 45 minutes before veal is done start the vegetables: Peel the shallots. Brush the mushrooms, remove stems. Thickly slice if large, leave small mushrooms whole. Heat 1 tbs of the butter and the lemon juice in a medium nonstick skillet. Add mushrooms and sauté until golden. Remove and set aside. Add remaining 1 tbs butter and whole shallots. Sauté until shallots start to brown. Add 1/4 cup chicken stock, reduce heat and cover. Simmer for 20 minutes or until tender. Remove cover and cook off most of the liquid. Add mushrooms to pan, cover and turn off heat. Remove veal and carrots from pot, cover and keep warm. Strain cooking liquid, put it back into the pan and bring to a boil over medium-high heat. Turn heat under sauce to medium-low. Dissolve cornstarch in water and thicken sauce. Remove from heat, add yogurt and nutmeg, stirring well. Put the gnocchi onto a platter. 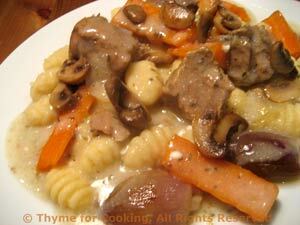 Arrange veal, carrots, shallots and mushroom on top. Spoon some sauce over meat, vegetables and pass the rest.